● Kyle Busch started 16th and finished eighth. 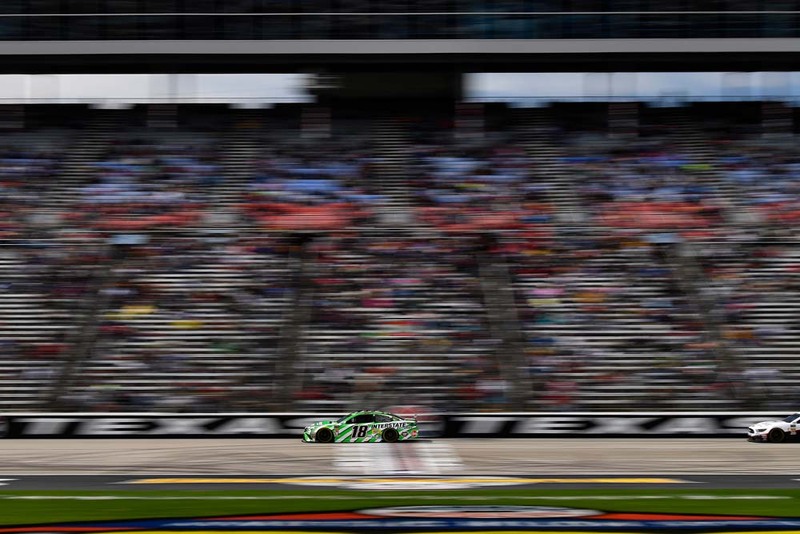 ● Busch quietly logged laps to start the 500-mile race at Texas. He was in 10th place when the first caution waved on lap 14. A miscommunication resulted in Busch coming down pit road to take fuel, but he missed the No. 18 pit stall. Rather than risk restarting from deep in the field Busch stayed out and was in 11th place when green-flag racing resumed on lap 18. ● During the next several laps Busch steadily picked up positions and was in sixth place when green-flag pit stops started on lap 59. ● As teams started making their respective stops Busch continued to climb in the running order. He took the lead on lap 63 and maintained it for three laps before coming to pit road for four tires and fuel. ● Green-flag pit stops cycled through right before the conclusion of Stage 1. Busch was able to race his way back to eighth place to finish the stage. ● Prior to the end of Stage 1, Busch reported that the car handled well in clean air but was still tight when behind other cars. He asked that the team try to help the tight-handling issue. Crew chief Adam Stevens arranged for an air pressure adjustment, two tires and fuel during the pit stop. Busch won the race off pit road but lined up sixth to start Stage 2 after a handful of cars stayed on the track. ● Started sixth and finished fourth. ● Knowing how much better his car ran in clean air, Busch wasted no time in making a bid for the lead. A good restart allowed him to move into third place on the opening lap of Stage 2, and he took over the lead on lap 99. He maintained the top spot until driver Chase Elliott passed him for the lead on lap 109. ● Busch reported that the car needed more front grip during the long, green-flag run. ● Green-flag stops started taking place on lap 140. Busch reassumed his position at the front of the field on lap 145. Caution waved on lap 147 for an accident involving the No. 42 car of Kyle Larson. Busch made a stop for four tires and fuel. Teammate Denny Hamlin took two tires only, which placed Busch in second place for the restart. He lost a couple of spots to finish Stage 2 in fourth place. ● The Interstate Batteries driver made a stop for fuel only during the break. 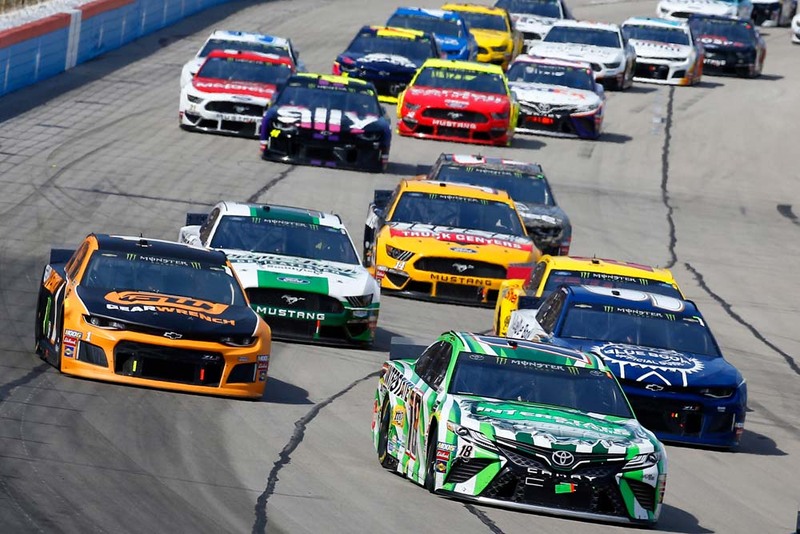 A number of cars elected to stay out, which resulted in Busch lining up in eighth place to start the third and final stage. ● Started eighth and finished 10th. 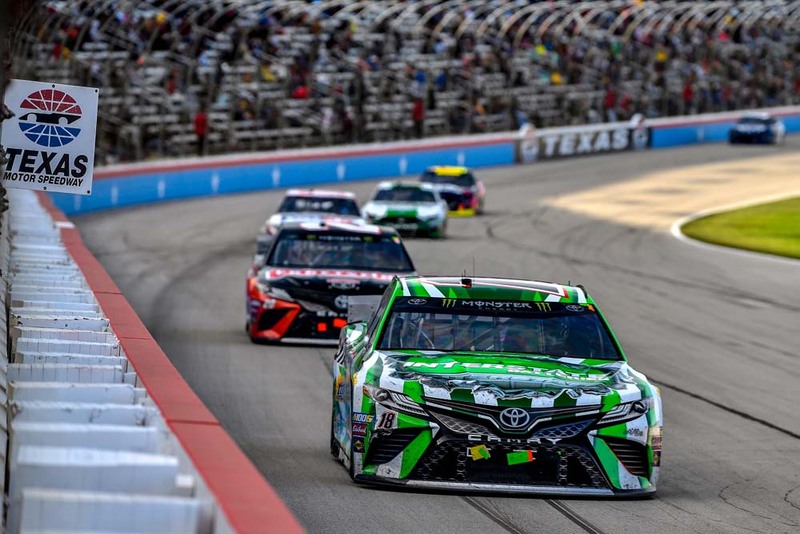 ● After a few laps at the start of Stage 3, Busch settled into a comfortable pace in fourth place, reporting that adjustments made to the car were starting to help it turn better. ● The cars that didn’t stop during the stage break started making their respective stops on lap 214. This allowed Busch to reassume the top spot on lap 221. ● The 2015 NASCAR Cup Series champion gave up the lead on lap 237 to make a green-flag stop for four tires and fuel. After a few laps were run and stops cycled through, Busch reclaimed the top spot on lap 246. ● Caution waved on lap 253 for an accident. Busch and the majority of the drivers behind him made a trip to pit road for service. The No. 18 Interstate Batteries team elected to make a minor chassis adjustment and add fuel only. Busch won the race off pit road but lined up fourth for the restart as three other cars elected to stay out. Green-flag racing resumed on lap 260, and by lap 264 Busch was back in the lead. ● After getting loose on lap 275 Busch was passed by his teammates Hamlin and Erik Jones. He lost one more spot before finally settling in at the fourth position. ● The loose condition became a bigger issue on lap 280 when Busch made contact with the outside wall. He had to make a trip to pit road for right-side tires and to allow the team to pull out the right-side fenders. Busch was a lap down in 23rd place once he made it back onto the track. 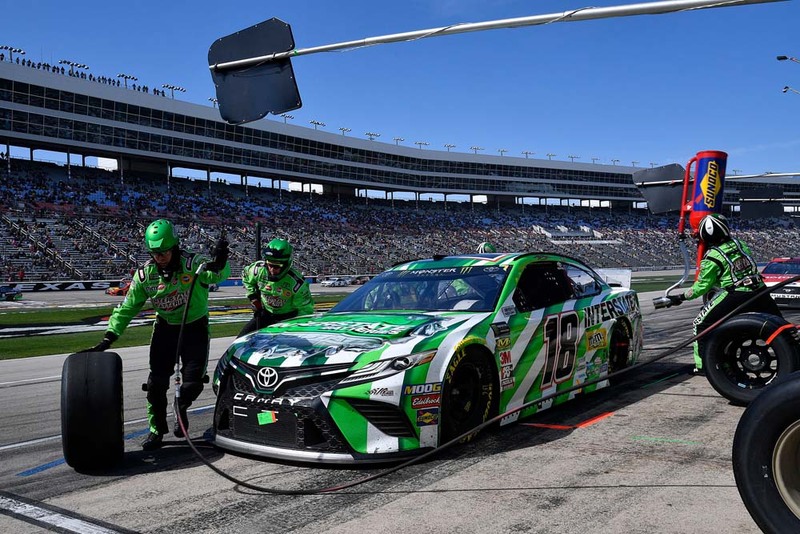 ● Because the rest of the field would have to stop one more time for fuel to make it to the end, Busch wound up being in a decent position to still secure a solid finish. Teams started to make pit stops as the laps wound down. Busch moved into 10th place with less than 10 laps to go and maintained the position to the finish. 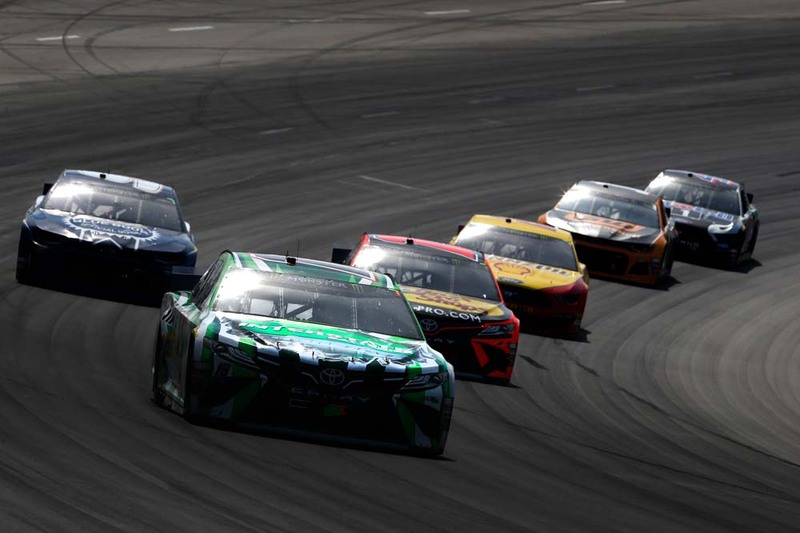 ● Busch led six times for a race-high 66 laps. 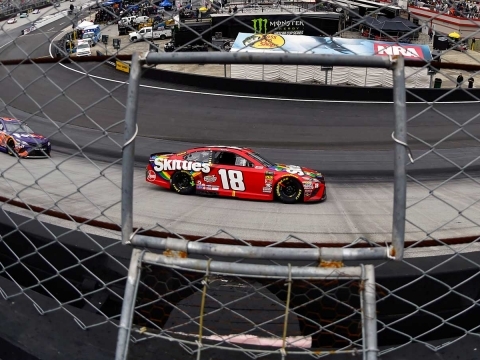 ● The 10th-place finish is Busch’s seventh top-10 of the 2019 season. ● Busch now owns three wins, 12 top-fives and 14 top-10s in 27 career starts at Texas Motor Speedway.